Foster: Lynnclaire Dennis gave me an unusual confirmation of the Fundamental Pattern. She passed out from lack of oxygen in a hot air balloon race over the Alps and was pronounced dead at the hospital. She later revived and felt compelled to draw what she’d seen in her near-death state. Though she had no scientific training, the mathematical accuracy of her intuitive drawings has been verified by numerous scientists around the world. Lynnclaire: I came to the end of a tunnel, which music had drawn me through, and I saw what I called “the strand of the tapestry” weaving all creation: It’s music. It’s light. It’s what matter is. It’s how matter moves, and it’s love. It’s a torus. It’s a toroidal field; it maps out energy moves in a natural system. It’s like the dynamics of our own DNA. It’s like a cell. It’s like a hurricane. We need to understand how space is organized, how matter organizes, because we have to re-inform ourselves in order to rebuild a new dynamic architecture that allows for our evolution that stops the fighting and the fear that’s going on. Lynnclaire Dennis is an author, artist, business person and visionary most commonly known for her work with geometrical patterning. Dennis became familiar with “the pattern,” a mandala linking all life and energy, during a near-death experience in the Swiss Alps. Her book, The Pattern , explores her life changing experience in Switzerland that exposed her to nature’s fundamental patterning and continues to inspire her work today. 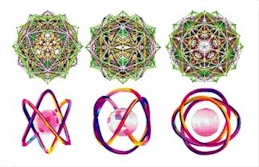 She has worked for 15 years with renowned mathematician Lou Kaufmann and geometer/physicist Robert W. Gray in explicating and illustrating the fundamental pattern she was explicitly shown in three consecutive journeys beyond the body. Dennis was a co-creator, along with Foster Gamble and several others, of the Sequoia Symposium, referred to in THRIVE. She has spent virtually all her time and energy in applying what she learned for the benefit of humankind, and especially to “teach the children” how the Universe works at the most fundamental levels. Here are some links to her current works and Indiegogo projects in the education and arts sectors. Enjoy! Indiegogo: I BELONG! Turning schools into places kids and teachers WANT to be! It's true!